310 x 224 mm. – Part I: 145 leaves, part II: 122 leaves, now reunited in one binding. With 3 full-page diagrams on human relationships (12th century), 1 large zoomorphic initial, 1 T-O map, and 1 inserted map of ancient Anatolia. For the first time in more than hundred years, two parts of this 10th century Isodurus manuscript are united again. A long-ago collector had split the book into two volumes, each containing ten books of 'Etymologiae'. Isidore of Seville (d. 636) summarized a tremendous mixture of knowledge into a single, vast reference work that functioned as an etymological encyclopaedia. Written in accessible Latin, the book was highly successful. The topics described include mathematics, canon law, celestial hierarchies, religions and heresies, philosophy, the human body, geography, weights and measures, medicine, animals, agriculture, and much more. The influence of the Etymologiae cannot be overestimated. One can discern at least two, likely more, campaigns of intervention in the present manuscript. First, the actual copying of the entire text was executed by various hands, all writing in Carolingian minuscule but with rubrics added in capitalis rustica. Dating to the 10th century seems likely, based on the presence of ligatures which fade out by the 11th century. Important corrections and additions are found in the beginning of Part I and in Part II. Apart from corrections, additions, and even indexing, interpunction and word division were applied later. These last interventions suggest that the book was used not only for study in silent reading but also for reading aloud. All interventions and corrections point to educational use in a school for reading correct texts aloud to students. However, the brief addition of a missing passage in Book XIV dealing with countries and regions is most extraordinary and informative. The text concerns regions in Asia Minor and is illustrated with an unknown map. 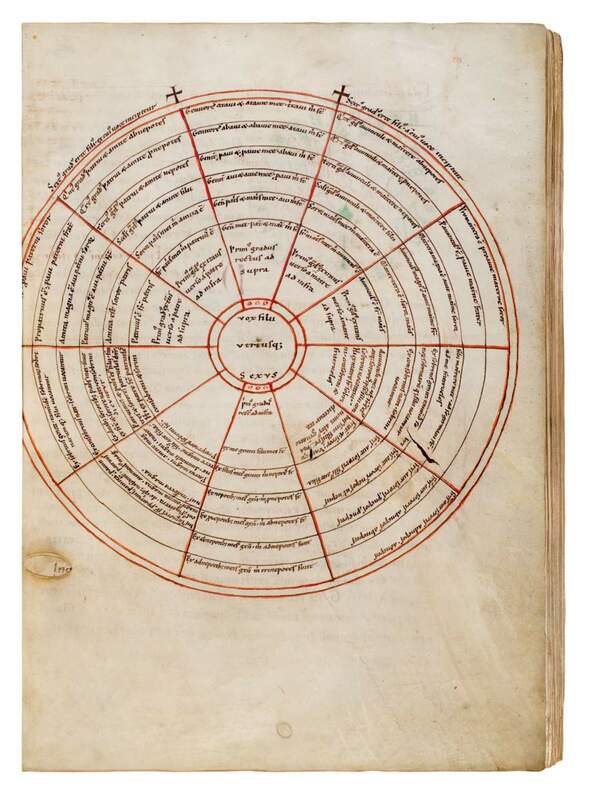 This unknown map is a so-called ‘Tournai-map’, closely related to one of two maps added to another 12th-century manuscript from St. Martin's. Drawn over erased first trials, these ‘Jerome-Tournai maps’ of Palestine and Asia Minor (with Anatolia disproportionately large) may ultimately be extracts from a world map that had its early roots in Ireland and Italy in the 5th century, or perhaps going back even earlier to the days of late Roman and early Christian traditions. As Book XIV of the Etymologies played a fundamental role in the Latin West in structuring of geographic knowledge, the discovery of this new Tournai map is quite exciting. The reunification of both parts of Isidore’s Etymologies is crucial for research into St. Martin’s as an intellectual centre with a growing awareness of cartography.